For this article, I thought I’d explore my top 10 favourite vintage guitars and why. As usual, this isn’t as easy as I thought it would be. There are so many great guitars to choose from and that’s just from Fender and Gibson, never mind the wealth of wonderful instruments from a multitude of other manufacturers. Here I focus on guitars from the big 2 brands only – an ‘alternative’ selection may be for another time. That got me thinking and then agonising about what to include, what to leave out, what order to put them in and how on earth I was going to justify my selection. They aren’t just CRAVE guitars (unfortunately! ), they simply represent what I see as the epitome of vintage guitar awesomeness, even if it is not the accepted view of the pinnacle of guitar greatness. What are my criteria for short‑listing you ask? In the end, there was actually only one criterion, my own personal value judgement. I make no excuse for being biased and, in some ways, prejudiced in my choices. To be clear though, it has absolutely nothing to do with financial value, which in my opinion is the abhorrent side of vintage guitars and should not be the starting point for inclusion (or indeed exclusion). 1. Gibson SG – specifically, for me at least, the Gibson SG Junior from the early-mid 1960s claims the prize at number 1. The single P90 pickup screams and a good one is just SO alive in your hands. The Junior can be a truly inspirational guitar to play and is clear evidence of ‘less is more’; its innate simplicity is also its vital strength. Don’t get me wrong, the Special, Standard and Custom all play their part admirably and are great instruments in their own rights with or without the bling. Whichever model you prefer, the SG is light, resonant, powerful, and has exceptional upper fret access. Many pundits relegate it unjustly to hard rock or metal duties because of its ‘devil horns’ shape but that overlooks its abilities. The SG is such a versatile guitar whether using P90 or humbucking pickups. Taking it to an extreme, just think of Jimmy Page with his twin-neck EDS-1275 in the ‘70s at Led Zeppelin’s peak. On this occasion, t’s the humble but astonishing SG Junior that takes the top spot, and deservedly so in my opinion. Simply sensational. 2. Gibson Explorer – unbelievably designed in the late 1950s, the Explorer is unique, avant-garde and a fantastic experience. Contrary to some views, they are surprisingly comfortable to play either standing or seated, although finding a guitar stand for one can be tricky! I have a soft spot for the ‘modernistic’ style, which in 1958 would have been shockingly radical for a musical instrument, even more so ‘out there’ than Fender’s Strat. After a brief reissue in the ‘70s, the Explorer was reintroduced in the 1980s and endowed with the mighty “Dirty Fingers” humbucking pickups which are something else when overdriving the right amp. They also released the arty Designer series, a flamed maple top of the E2 and CMT variations, as well as a few with 3x P90 pickups! Also like the SG, it is misunderstood – it isn’t just a metal guitar, although it is undoubtedly the progenitor of, and the archetype for, so many heavy rock guitars that followed. Like its shape, the Explorer demands something from its player – take the challenge head on and don’t shy away from it – it’s well worth it. 3. Fender Telecaster – the first mass-produced solid body electric guitar, the humble but expertly designed Tele has endured for over 6 decades and is still evolving today (the intriguing Cabronita, anyone?). For me, the standard Tele is a fabulously versatile ‘do it all and more’ guitar. However, my particular interest stems in the CBS-era variants, such as the wonderful Thinline, the Gibson‑infused Deluxe and the ‘Keef’ influenced Custom, all blessed with terrific Seth Lover designed humbucking pickup. Unfortunately, I can’t afford an original single-pickup Esquire or the Custom Telecaster with the bound body but I keep looking. In the early 1980s, there was also the “Dan Smith”‑era Elite, with active electronics to mix things up a bit. Why not search out a Tele derivative and explore what it can do, you may well be surprised? While the more esoteric models will never replace the professional’s workhorse, they complement it nicely. Like the Stratocaster, the early ones are sadly now becoming too expensive for most of us. 4. Gibson Les Paul – I’m not talking about just any old Les Paul here, let’s take a walk on the wild side within the iconic family. For me, it’s the early single-cut Les Paul Special in TV Yellow or tobacco sunburst with 2 P90 pickups that is really, well, special. The double-cut Junior and Special are also hugely underrated compared to their brethren with a delightful body shape to boot. On this occasion, though, the Special beats the Junior. More leftfield is the Recording, a low impedance design favoured by the legend with his name on the headstock. Then there’s the Deluxe with its cute mini-humbuckers giving it a unique voice. Going more mainstream, there is the Custom with all its uber-rock flamboyance which, as a young aspiring guitarist, was bewitching in its appeal. Finally, who can deny the historical significance of a ‘50s Standard in either original gold top or later sunburst finishes; if only they weren’t way out of the reach of us mere mortals. Sigh. 5. Fender Jazzmaster – another late ‘50s design. Quite bulky but, wow, what a departure from the established Strat and Tele lines. The unique single coil pickups, the rhythm circuit and the bespoke muted vibrato give it a special place in electric guitar evolution. The Jazzmaster’s partner in crime, the Jaguar is equally notable with its shorter scale and even more complex electrics. Both represent an innovative alternative to the norm. Intended to be top of the Fender range, the Jazzmaster failed to find favour with the set-neck, archtop brigade, and found its niche in surf rock of the Beach Boys, post punk, like Elvis Costello and, more latterly, with dirty indie music from the likes of Sonic Youth and Dinosaur Jr. There is another notable variation on the offset body theme, the quirky Fender Bass VI, a phenomenal instrument if you can attune to its idiosyncrasies. Another quirky variant is the Electric XII, more than simply adding 6 extra strings. If you can lay your hands on a vintage Jazzmaster or Jaguar in a custom colour, grab it, play it, and smile… a lot. 6. Fender Mustang – this may not be everyone’s choice but in my opinion, the Mustangs, along with siblings, the Musicmaster and Duo-Sonic (and obscurely, the Bronco) are not only cute but also crucial to making quality instruments available to a wider mass audience. They demand more respect and credibility in some quarters. Not everyone could afford premium instruments… or even physically play them! The quality is top notch and, looking beyond the ‘2nd class citizen’ stigma, they actually sound great and, for some, are easy to play. Without the Mustang family, many guitarists may never have picked up a guitar and eventually turned pro. As a guitarist, I find using one up makes me play slightly differently, so they are good when inspiration or a change in mood is needed. Although they are now going up in value, vintage Mustangs et al are under-appreciated by collectors and, as a result, are certainly more accessible to ordinary people on a budget which, let’s face it, is probably most of us. Recommended. 7. Gibson Firebird – now here’s an interesting instrument and one deserved of greater adoration. The Firebird dates from early ‘60s industrial design. First there was the neck-thru ‘reverse’ body with the side wings, awesome mini‑humbuckers and banjo tuners, perhaps the model most observers are familiar with. Originally not that successful and prohibitively expensive to construct, they went and changed it completely! Gibson went through a short period where more traditional manufacture was needed and the ‘non‑reverse’ body came along, which in my view is just as worthy of critical attention and, is arguably, aesthetically very attractive. Some say the ‘non-reverse’ shape ripped off Fender’s Jaguar/Jazzmaster, you decide. And… what’s with the model numbering – I, III, V, VII? The Firebird design also spawned the remarkable Thunderbird bass. The whole aura surrounding the Firebird is eccentric and intriguing. OK, so the ‘reverse’ body is unbalanced and a bit of a handful but, what the heck, just let those ‘birds fly. Like the guitar’s namesake, the phoenix has risen from the ashes for the new millennium and it really rocks. 8. Fender Stratocaster – the Strat is just SO significant in modern music history that it has a following of almost religious proportions. Its past, present and future is pretty much cemented and, arguably, it would be heresy to mess with the basic premise too much. It remains a stunning guitar even today, let alone in the mid-‘50s when it was let loose on the public for the first time. For me, though, it hasn’t quite had the diverse range of interesting, experimental derivatives to excite its way to the top of the list (compare the Telecaster and Les Paul entries). The Strat’s historical dominance almost imposes a moral obligation to include it here. My other axe (sic!) to grind is that pretty much any pre‑‘70s U.S. Strats are just so expensive on the vintage market, meaning that a genuine, good condition old Strat is now for the pros and collectors only. Undoubtedly the Stratocaster is a great instrument that, on its merits, justifies inclusion in any list of greats, although not simply by default. Equally, it cannot be ignored because of its innate familiarity, so here it is at number 8. P.S. 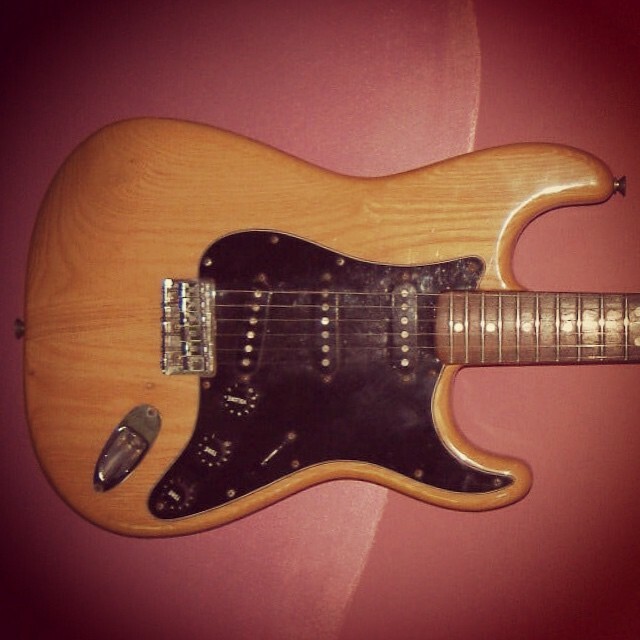 Don’t get me wrong, one of my favourite guitars is a ‘70s Strat! 9. Gibson Melody Maker – a chart entry warranted on much the same basis as the Fender Mustang at number 6. So why, you might ask, is the unassuming Melody Maker 3 positions down from the Mustang? I think it’s a lack of coherency over its short original life, like it was trying to find its real sense of purpose and place. The early, short-lived (and therefore rare), Les Paul-like single cuts are fabulous and the 2nd generation MMs have, in my opinion, one of the prettiest body shapes that isn’t famous or in current use. The 3rd incarnation, in my view, is plain ugly, especially compared with what went before. The 4th and final vintage shape was (lazily?) based on the SG, which undermined both instruments’ credibility (but still cool). So, a bit of an identity crisis but cutting to the chase, underrated and much, much better than the traditionalists (snobs?) would have you believe. The Fender-like single coil pickups didn’t find favour with pro musicians seduced by humbuckers and P90s. Unbelievably light, resonant, easy to play and those cheeky single coil pickups are funky and cool. There is a potential ‘bargain’ to be had for many vintage enthusiasts. 10. Gibson ES-330 – perhaps another controversial entry, given all the hyperbole and plaudits associated with the ES-335. Perhaps that’s why I want to raise the profile of the P90-equipped ES-330 semi. While the humbucker-endowed ES-335 has the solid maple block running through the body, the ES-330 is fully hollow. People heap praise on the Epiphone Casino but not so much on the understated ES-330, despite the fact that they are essentially the same design, suggesting some sort of unfair partiality (and perhaps The Beatles affiliation). The single coil pickups combined with the hollow body make it light, resonant and give it a distinctive vintage vibe all of its own. OK you wouldn’t want to use it in high-gain situations but, come on, it isn’t a heavy rock/metal guitar anyway. In today’s low-decibel world, they are finding proper recognition. Acknowledgement is bestowed on the ES-335 and its upmarket siblings, the ES-345 and ES-355, as well as the Trini Lopez signature model. However, for my list, it’s the modest ES-330 that takes the last-but-not-least place in this particular top 10. There you have it. What was left out? Well there is the Gibson Flying V mainly because it is such an impractical beast and just such a difficult instrument to play sitting down or even to put on a normal stand. I haven’t included the seminal Fender basses because, let’s be honest, I’m a guitarist, although they deserve acknowledgement. Furthermore, I would advocate every guitarist picking up a bass every now and then to take a different perspective on making music. There are plenty of other ES-range guitars, such as the ES-150 (top of my ‘wanted’ list) and ES-175, both great guitars and, for me, both just outside the top 10. The Fender thinline semis (Starcaster and Coronado) just didn’t make the grade in this company, sorry. Extending the selection to Gretsch and Rickenbacker is beyond the scope of this article (and my knowledge). Also, the list has to stop somewhere. © 2015 CRAVE Guitars – Love Vintage Guitars.